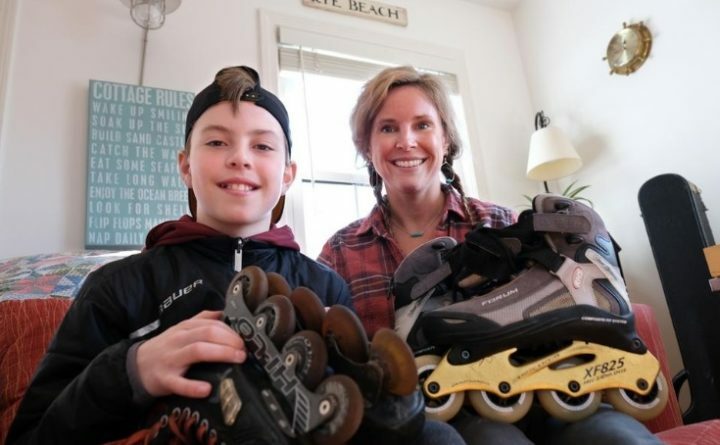 Cam Noyes, 12 and his mother, Kristen Umlah, talk about their victory to make street skating legal in Rye, New Hampshire. Noyes and his brother Winston worked to get signatures for a petition and put inline skating on the ballot. Voters approved it on March 12. A 12-year-old boy, who aspires to play for a National Hockey League team, convinced voters to legalize inline skating in town, almost two years after he and his mother were warned by police their street skating was illegal. A hockey player since age 2, Cam Noyes said he’d been inline skating around Rye for years before he heard it was an illicit activity. He said he discovered the prohibition in late August 2017, when he suggested his mother skate with him to his first day of sixth grade. His mother, Kristen Umlah, said many Rye students ride bicycles to school, but they’re not cyclists. She said when they got to the Rye school on their inline skates, Police Chief Kevin Walsh was there directing traffic and told them their skating was not allowed. After she explained it to her son, “Cam said, ’We weren’t roller skating, we were blading,” Umlah said. “I had been rollerblading all summer and I never saw a police officer,” Cam said. “We both came home and decided we can give up, or learn about the process” to change the law, Umlah said. In the meantime, Cam made Rye’s inline skating prohibition the focus of a school social studies project. The mother and son learned they needed 25 signatures to get a warrant article in front of voters, so Cam went door-to-door with his 6-year-old brother Winston and they collected 31. Reactions from residents asked to sign their petition ranged from “Rollerblading is illegal?” to “Of course I’ll sign it,” Umlah said. The signatures were brought to Town Hall last November, when Umlah and Cam also attended a selectmen’s meeting to ask for the board’s endorsement. Under every warrant article is a notation, in boldface type, noting whether or not the board endorsed it and Umlah and Cam wanted that endorsement. Umlah said Cam was called to address the board, introduced himself and made his pitch. Cam said the police chief showed a photo of someone inline skating, with their arms and legs extended, to which he countered that posture was known as “pitching hay” and not proper skating posture. Cam said he was asked what would happen if he hit a pothole, or got a rock caught in a wheel and he explained he would switch to the other foot. He said he and his mother drove around town and observed most potholes are in the roads, not on the sides where skaters would be, so he told the board that, too. “We didn’t think it was fair that the town could pick and choose what kind of exercise people can do,” Umlah said. They next launched a social media campaign and had T-shirts made that said, “Vote yes on article 29, Roll Rye Forward,” with the words shaped like an inline skate. When she drove him to school the next morning, they played the song, “We Are The Champions” and when he got home, they went inline skating. Noyes said his classmates were happy when they heard the news, while some asked why he didn’t also get a town-wide skateboard prohibition removed from the same ordinance. “I don’t skateboard,” he said.